Tibial Nerve is a large branch of the Sciatic nerve. the point of origin is above the popliteal fossa and goes downward respectively through middle of popliteal fossa and posterior compartment of leg and afterwards goes into sole of foot by passing deep to the flexor retinaculum where it divides into medial and lateral plantar nerves. The tibial nerve goes under the tendinous arch created between the fibular and tibial heads of the soleus muscle and goes vertically through the deep region of the posterior compartment of the leg on the surface of the tibialis posterior muscle with the posterior tibial vessels. The tibial nerve leaves the posterior compartment of the leg at the ankle by passing through the tarsal tunnel behind the medial malleolus. It enters the foot to supply most intrinsic muscles and skin. Two cutaneous branches, the sural nerve and medial calcaneal nerve. It originates on the back of the thigh in the junction of the upper 2/3rd and lower 1/3rd and enters the popliteal fossa. 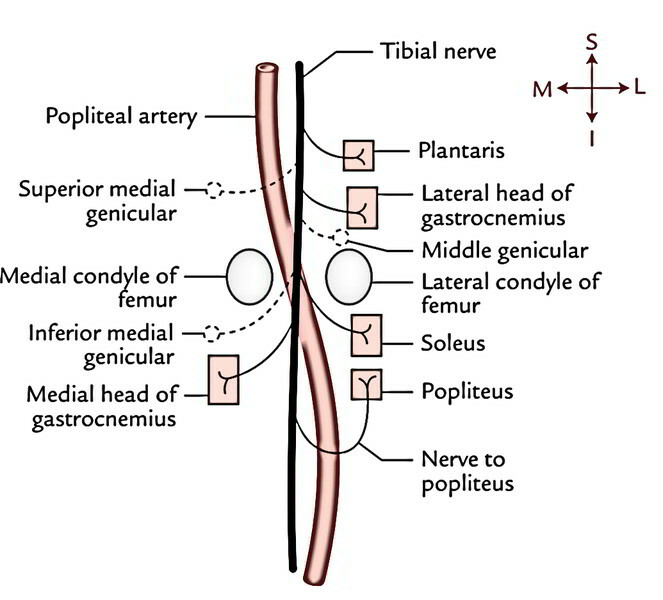 From the popliteal fossa it enters into the posterior compartment of the leg, by passing deep to the tendinous arch of origin of the soleus together with the posterior tibial vessels. Its course and relationships in the leg are like that of the posterior tibial artery. In the leg, the nerve is lateral to the artery in the beginning, and after that it crosses posterior to the artery from the medial to lateral side and after that runs along the lateral side of the artery. 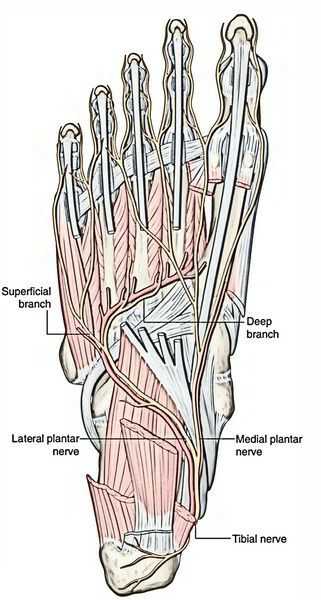 It ends deep to the flexor retinaculum by breaking up into medial and lateral plantar nerves. 1. Muscular branches: They provide gastrocnemius (both heads), soleus, plantaris, and popliteus. All the muscular branches of the tibial nerve originate from its lateral side with the exception of the nerve to medial head of gastrocnemius, which originates from its medial side. For that reason, lateral side of the tibial nerve is named dangerous side and medial side as the safe side. 2. Genicular branches: they’re 3 in number (superior medial genicular, inferior medial genicular, and middle genicular) and accompany the arteries of exactly the same name. The middle genicular nerve pierces the oblique popliteal ligament and supplies the inner part of the knee joint. 3. Cutaneous branch: It’s named the sural nerve and originates about the middle of the popliteal fossa. It runs vertically downward underneath the deep fascial roof of fossa and makes the fossa by piercing the roof near its inferior angle. 4. Vascular branches: They supply the vasomotor fibres (T10-L2) to the popliteal vessels. Foot is held dorsiflexed and everted, because of paralysis of the muscles of posterior compartment of the leg. Loss of bulge of calf and tendocalcaneus, because of paralysis of the triceps surae muscle (gastrocnemius and soleus). Loss of plantar flexion of foot, as a result of paralysis of the flexors of ankle. Inability to stand on the toes, as a result of loss of plantarflexion of foot. The loss of sense in the sole and plantar aspects of the toes consisting of the dorsal aspects of their distal phalanges, as a result of engagement of the cutaneous branches. It happens because of compaction of the tibial nerve in the Osseo fibrous tunnel below the flexor retinaculum of the ankle. It medically presents as pain and paresthesia in the sole of the foot, which frequently becomes worse through the nighttime. Morton’s metatarsalgia (also named plantar digital neuroma): It happens as a result of the formation of a neuroma following pressure on 1 of the plantar digital nerves just prior to its bifurcation at 1 of the toe clefts. It most commonly impacts the plantar digital nerve running between the 3rd and fourth metatarsal heads to the 3rd web space. Medically, it presents as occasional pain on the plantar aspect of the forefoot generally between the 3rd and fourth metatarsals.